If you’re an entrepreneur, you know that staffing issues that plague us all. We constantly need help. Sometimes we need higher-level help, which can be a tough spot to find yourself in. 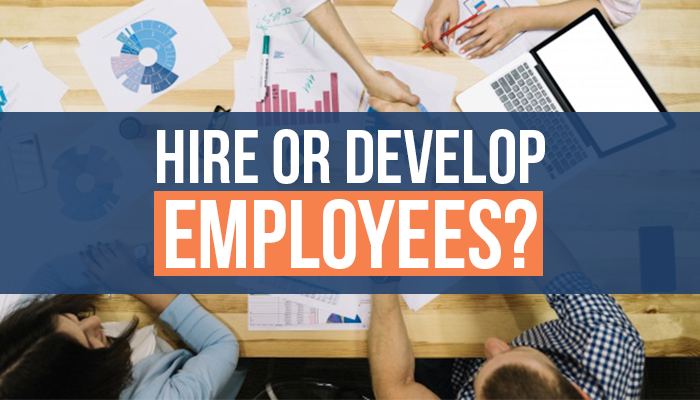 The question here is, do you hire talent or develop it? In my business, social media marketing, hiring talent isn’t always easy, and rarely affordable. Colleges might offer social media classes as part of their marketing courses, but by the time the curriculum is developed and ready to be incorporated into a schedule, the information is mostly obsolete. Social media marketing changes at the speed of light, and keeping up when you’re actually in the business is daunting. I can’t imagine how tough it would be to keep class materials up to date! We always seek people who are willing to learn and who bring something to the table that we might be missing. We start most of them off as interns to see whether they fit with our culture and our brand. We’re a crazy, quirky group of people, and not everybody’s flavor of lollipop. As a leader, I am a very direct communicator, and this can be less than ideal for some personality types. I understand this and hire accordingly. There’s a real chance I won’t change – as I write this, I’m 53 and accustomed to being a bit of an acquired taste. Bring them on as interns. They’ll know quickly if this work is for them or not. Ask several team members at different levels to interview them. They will all have to interact with the new hire, so they should think it will work. Check out their personal social media. If this doesn’t tell you a story, nothing will. If you don’t like who they are on social, don’t hire them. Grammar check. For us, this is huge. Give them a grammar test. They should pass with high scores; if they don’t, walk away. Most entrepreneurs hire because someone was recommended to them or they knew someone who was looking for a job. Although this may seem like a good idea, the statistics are not in your favor. The cost of a bad hire can set you back and set your other team members back– so hire slow, and fire fast. Once you’ve selected a new team member, invest in them, and spend an adequate amount of time training them so they can become everything you want to be in your organization. As the team leader, visit them often to see where they are on the satisfaction scale. Do they feel they are progressing? Do they feel they have the tools necessary to get to the next level in their career? Do they have personality conflicts with anyone on the team? Do they believe there’s a permanent place for them in your organization? Do you and your team feel the new hire has potential? Do you believe they will strive for excellence? Do they share your company culture? Do they have the drive to deliver excellence at every turn? Can you see them becoming a leader in your company? Once you begin developing talent, it will become easier. You will get a system down, and it will soon be evident whether this person is a fit or not. As your business grows, whether you decide to nurture your own or hire the talent that you need, a process for onboarding and training will be paramount. It will make the hiring nightmare go away. Begin by writing personality profiles of your current staff to see what component might complement your current team.